April 4, 2019 (Falmouth, MA) – McLane Research Laboratories, Inc. announces that the Prawler, a low cost, shallow profiling vehicle is now available as part of the McLane Profiler product line. The Prawler collects and transmits sensor data from the surface to 500 m of the water column, traveling the mooring wire using wave actuated motion. April 9-11 will be the first showing of the McLane-manufactured Prawler at Ocean Business in Southampton, UK. Visitors to Stand A29 will experience a full-size Prawler first-hand. Prawler is a field-proven instrument originally developed by NOAA’s Pacific Marine Environmental Lab with support primarily from NOAA’s Office of Oceanic and Atmospheric Research Climate Program Office. Years of successful Prawler deployments include two NASA projects to examine the salinity balance in the upper ocean (SPURS and SPURS-2). “We’re very excited to transfer this ocean-proven technology to McLane so they can make it available to the community,” says PMEL Director of Engineering Chris Meinig. Wave motion and special ratcheting cam cleats move the Prawler up the wire. The vehicle free-falls or ratchets down the wire in high currents at user settable depths to the bottom of the sampling range, collecting data during descent. Depending on installed sensors, the Prawler can collect conductivity, temperature and depth (CTD), optical backscatter, and dissolved oxygen measurements and transmit the measurements in near real-time via an inductive modem. Minimal wave action is required for movement making Prawler suitable for coastal locations such as lakes and reservoirs as well as open ocean applications. Continuous instrument movement and deep parking options, minimize biofouling on the Prawler and mooring line compared to traditional mooring line sensors. The Prawler can be installed on various types of mooring configurations. Depending on configuration, deployments of up to 20 profiles per day for 12 months are possible. Data resolution from ~2m to 10m+ is settable depending on data and endurance requirements. 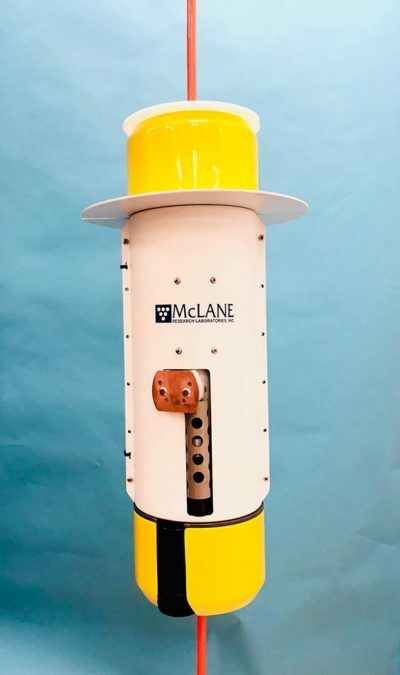 McLane Research Laboratories manufactures time-series in situ oceanographic instrumentation for scientific deployments in the open ocean, and freshwater environments. Three main oceanographic product lines are available: profilers, samplers and flotation.